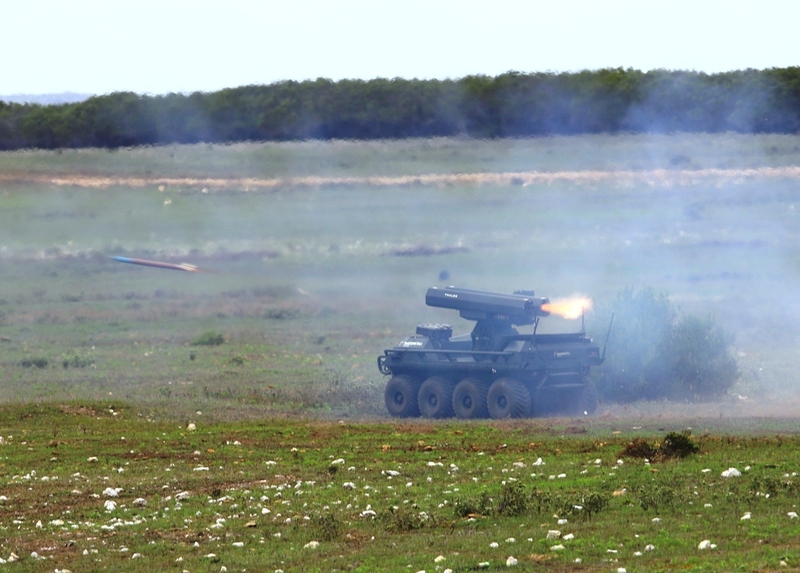 A ripple of 14 rockets hits the enemy outpost, the barrier of fire having been launched from a mere 750 kg kerb weight 8×8 unmanned platform, the firing order coming from a single South African Special Forces operator located at safety distance, controlling the Mission Master Protection UGV and mostly important its weapon system via its PDA with a simple Human-Machine Interface. 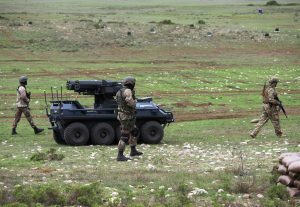 Further back, the rest of the SF detachment is waiting, supported by a Mission Master Rescue, the CASEVAC version of the 8×8 UGV developed by Rheinmetall Canada. 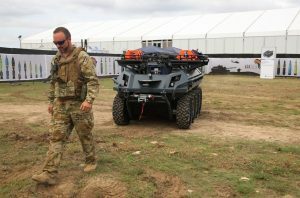 During the insertion phase both unmanned vehicles deployed using the “follow me” function, rolling alongside the SF warfighters, leaving these free to carry on their mission without worrying about their support vehicles, which added consistent organic punch and medical capacity to the team, something that would have been impossible without those UGVs. 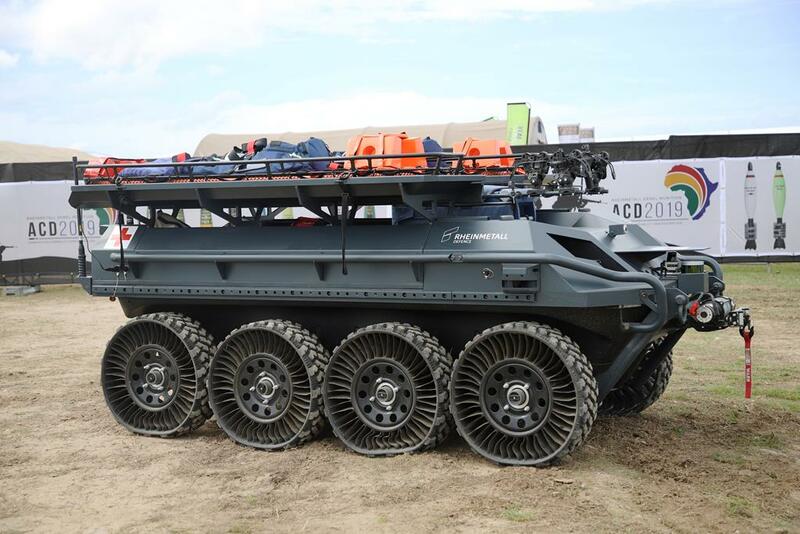 The Mission Master has been around for some time, first as a concept, then as a prototype, and finally as a product, the frozen configuration having been unveiled in June 2018 at Eurosatory, further details having been provided at Rheimetall Defence Talks in Vienna last December. 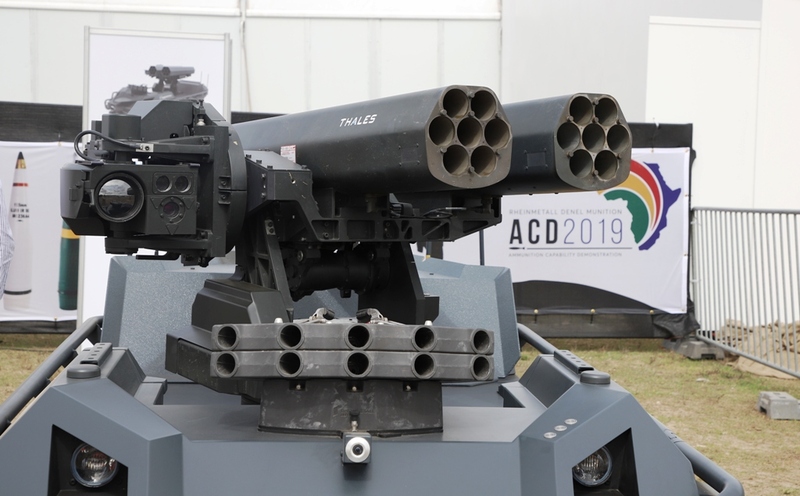 At ADC2019 the vehicle has made a considerable step forward: “We spent one month here in South Africa, and in this period we managed to carry out all necessary testing to qualify our platform according to STANAG standards,” Alain Tremblay, VP Business Development and Senior Director Innovation at Rheinmetall Canada, and a retired Major General in the Canadian Defence Forces with considerable infantry experience having served among others in the 22nd Infantry Regiment, tells EDR On-Line. Most of the qualification process concerned security and safety issues, as well as fault management procedures. 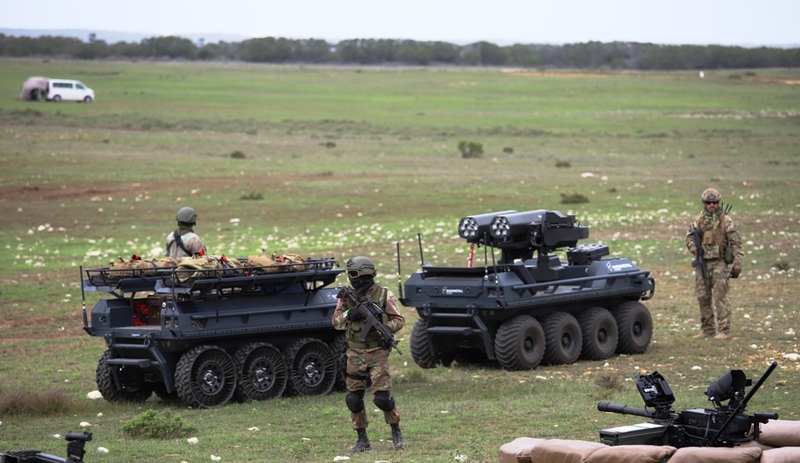 The Mission Master is now fully ready to be integrated in a modern combat scenario, its IFF and Command and Control capabilities being fully at standard. Coming to the weapon system installed, the Mission Master Protection has been demonstrated fitted with a stabilised turret of the Fieldranger family armed with two 7-rockets pods per side, an optronic sighting and aiming system being installed on the right; the elevation arc is -20°/+60°, traverse and elevation speed being 50°/s. 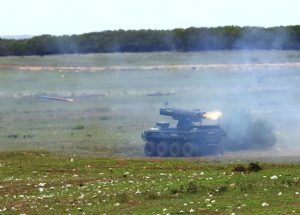 This configuration allows a single man-in-the-loop to unleash a cascade of fire on the enemy; various warheads are available to the Thales 70 mm unguided rocket, the dart version carrying 2,200 darts per rocket, which when 14 of them are fired makes a barrier of 30,800 small darts, well enough to stop any enemy infantry attack; of course single fire mode is available as well as selected ripple fire. The demonstration was carried out on coordinates; an autonomous firing mode against target troops is under development, a digitised 3-D data base being built, this function being implemented using the thermal camera included in the sensors’ package. 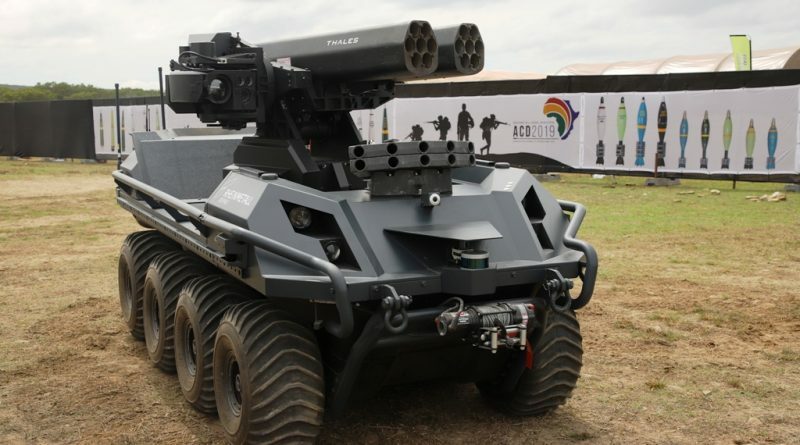 In the planning phase it will be possible to tell the system which types of targets it should acquire and neutralise. “We started from the most difficult option,” Alain Tremblay explains, “that is the man out-of-the-loop, to be used in deliberate operations.” The two other modes are the “man-on-the-loop” where the UGV is given a killing zone, which it scans until it acquires a target, then calling the operator and requesting authorisation to fire, and the “man-in-the-loop” where the operator has full control of the weapon system. 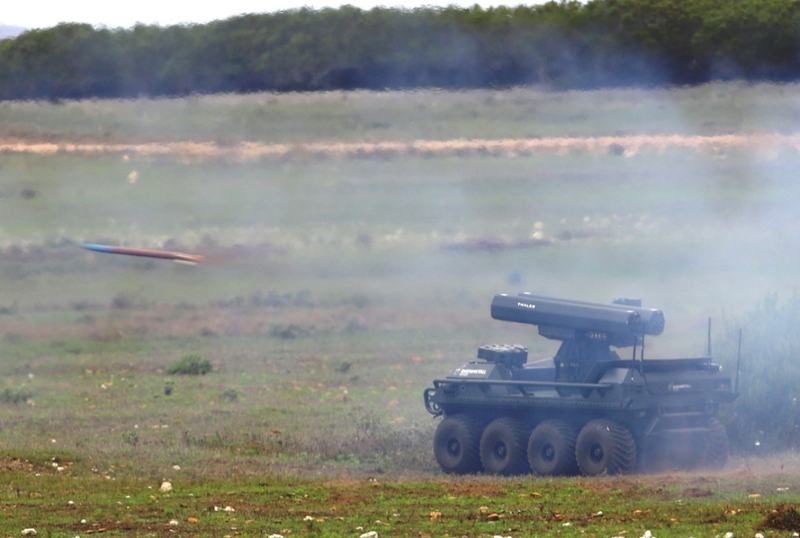 Unguided rockets have a 7 km range. 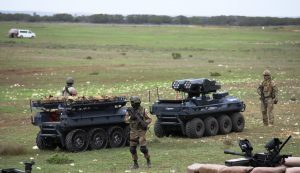 However the Mission Master can be fitted with other weapon systems, such as RCWS armed with 12.7 mm machine guns, 40 mm automatic grenade launchers, up to 30 mm Low Recoil cannons such as Northrop Grumman 30mm M230LF Bushmaster Chain Gun. According to Rheinmetall Canada the demonstration carried out at the Overberg range was also the first of a remotely controlled system operated in a fully digitised scenario, the firing having been controlled through the Argus digitised soldier suite; when operating in a digitised environment the Battle Management System can easy know friendly positions down to the individual soldier, the on-board BMS operating on a dedicated computer used to receive orders and to control the weapon system, all functions related to the vehicle autonomy being installed on a second computer. 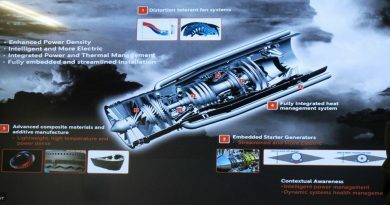 As for autonomous navigation capabilities, the Mission Master inertial system allows it to operate in GPS-denied areas, a key element in various scenarios, the urban one among others. While the “Protection” version was among the stars of ADC2019, the “Rescue” is worth some words, an integral CASEVAC capability helping in keeping up the troops’ morale; in this configuration the Mission Master is fitted with two basket stretchers with sliding provisions, head and foot immobilisers, the UGV also carrying oxygen masks and bottles, a defibrillator and a hot/cold box, a suite that it would be impossible to carry on foot. 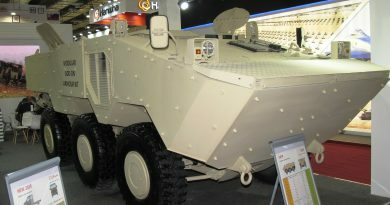 While in the infiltration phase the UGV can be operated in the “follow-me” mode, medics being part of the combat team, should casualties occur medics could accompany wounded soldiers loaded on the Mission Master travelling on dedicated seats, the UGV eventually following pre-programmed extraction paths. 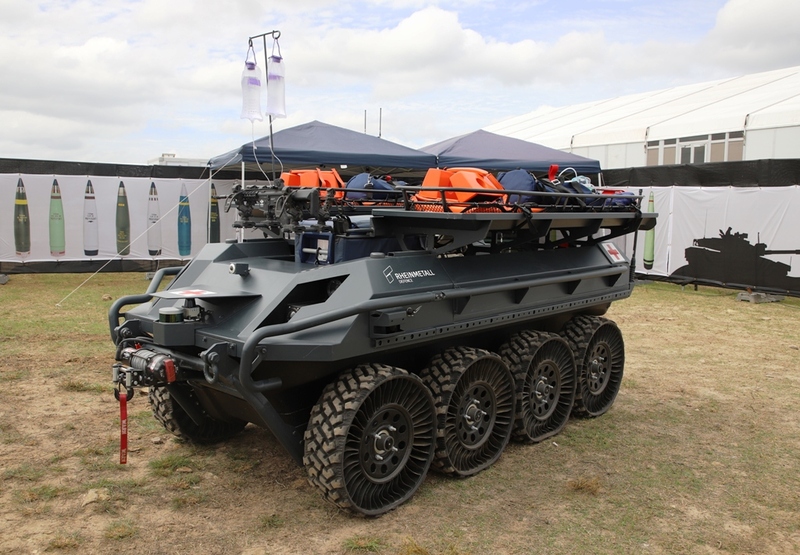 Looking closely at the Mission Master Rescue deployed at the Overberg range for ADC2019, it was possible to note a major difference compared to the Protection vehicle: the medical UGV was fitted with NPTs (Non Pneumatic Tires), while its armed companion used the standard inflated tires: “We wanted also to test new solutions, however NPTs proved to have limitations on certain types of terrain,” Tremblay says, underlining also that this type of solution would bring to the loss of the Mission Master’s amphibious capability, the Rheinmetall Canada’s UGV being capable to float at half the maximum payload, that is 300 kg versus 600 kg. 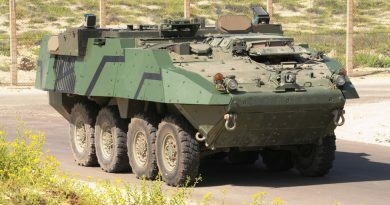 “The Mission Master is currently at TRL7, as we are awaiting a first contract that will bring us to TRL8, an operational deployment allowing then to reach TRL9,” Alain Tremblay concludes, telling EDR On-Line that the aforementioned versions fitted with new weapons configurations will be shown only once they will be sufficiently mature.